Over the years, a number of individuals have accumulated vast private collections of sports memorabilia. These collections are so broad that it is impossible to know who truly has the largest sports memorabilia collection. It is estimated that there are 50 to 100 serious memorabilia collectors in the United States. They typically have acquired their items through private dealers and auction houses. Who are these individuals and how did they go about collecting what they have? A search of the internet reveals a number of amazing stories. This article shares the stories of two of these private collectors, both of whom have a large amount of baseball memorabilia. Mr. Cypres, in his 70s, is founder and CEO of Sports Museum of Los Angeles. He made his money by establishing finance and travel businesses that catered to the surging Hispanic market in the 1990s. In his earlier career he served as an executive in several financial organizations. Though he maintains his 32,000 square foot, two-story museum in a warehouse in Los Angeles, it is no longer open to the public. Estimates of the value of his sports collection range from $10 to $20 million. 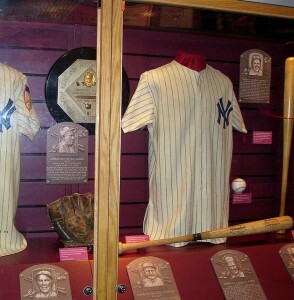 Items in his collection are primarily related to the New York Yankees and the Brooklyn Dodgers, with special focus on the years 1947 to 1957. During those years the Yankees and Dodgers met in the World Series six times, the Giants and Dodgers made their move to the West Coast, and Jackie Robinson was signed by the Dodgers, breaking the color barrier. Other key players included Duke Snider, Willie Mays, and Mickey Mantle. Asked how he got started collecting, Mr. Cypres stated, “Like anything, on the lowest end of the totem pole. I would stand in line at a card show for 45 minutes, go around and see everything, met the dealers, wrote to them to get brochures.”1 He indicated that it is still a good time to be collecting sports memorabilia because the market is strong and there are many new, young, wealthy buyers entering the market. Now in his mid-70s, Joel Platte is Chairman of Sports Immortals. Prior to founding Sports Immortals, Mr. Platt was a business entrepreneur. He excelled in amusement attractions, merchandise sales, and especially in commercial real estate. Mr. Platte’s collection of memorabilia has been a featured story in magazines and periodicals, as well as on national television. With more than one million mementos of memorabilia, his collection is now valued between $50 and $100 million! The collection is quite varied, ranging across a number of sports. 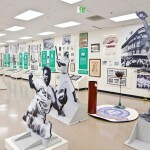 It is considered by many to be the largest private collection of sports memorabilia in the world. The story of how young Joel became interested in collecting is amazing. It began when he was four years old. He found some matches, lit one, and then tossed it down the gas tank of a car. The explosion put him in bed for the next year. These past 40 years Mr. Platte has traveled far and wide, over one million miles, to meet with sports legends and to visit their relatives. His goal has been to obtain and curate memorabilia from the legend’s sports achievements. Sports Immortals now houses about 30,000 of Platte’s mementos. Among the most interesting pieces are Jim Thorpe’s entire collection of personal items, including his scrapbook from the 1912 Olympics. Also included are Lou Gehrig’s glove, a rare but real Honus Wagner baseball card from 1909 (Pittsburgh Pirates great from early 1900s), and numerous game-worn jerseys from greats in baseball, football, basketball, and other sports. To preserve the memories and achievements of the greatest athletes in sports history. To make enshrinement as a Sports Immortal be one of the greatest honors achievable in sports. To establish a foundation that would contribute to sports medicine research and related organizations. To inspire and motivate every visitor to strive for maximum effort in his or her life endeavors. I hope you enjoyed this brief insight into a couple of the owners of large sports memorabilia collections. Please feel free to share this article on you social sites by clicking on the appropriate icon(s). Also, if you are aware of other large collections, please share your insights with us by submitting a comment below. Great info- well explained. You can certainly tell that you have a passion for this sorta thing! I am amazed at how large these collections are in this post. I have to say that you really must have a lot of patience and an eye for finding just the right items to collect some rare items. Cool and informative read. It is incredible, isn’t it? Many of the extremely rare items are purchased through auctions or private exchanges. These guys have spent a lifetime collecting. There are also a lot of items available today on major memorabilia websites.